Just because you’re stuck raising a kid until they turn 18 doesn’t mean you have to live with a dead phone. 4moms’ new Moxi stroller has a killer feature for parents who are balancing raising a kid while posting endless baby photos to Instagram—generators built into the rear wheels that feed power to a USB port in the handle. Choosing a stroller for your little one can often be an overwhelming task given how many options are out there, each claiming to be the safest and most utilitarian choice. But with Pokémon Go now draining everyone’s smartphones, finding a reliable place to recharge is now a higher priority. 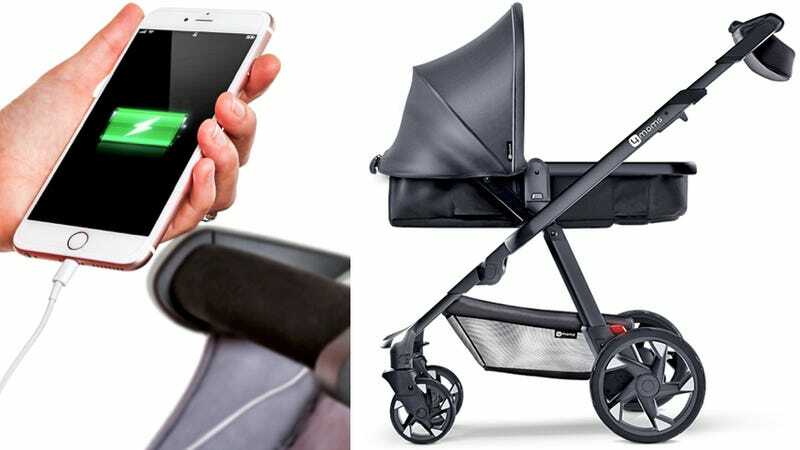 A quick stroll around the block with this stroller will not only help put baby to sleep, it will also let you top off your battery, and maybe even capture a Squirtle. That’s not the only reason to consider the 4moms Moxi stroller once it’s available in October for a hefty $700. Those generators also power headlights and taillights to illuminate your path and make you more visible at night, as well as connectivity to an app that lets you tweak certain settings for the stroller, and track how far you’ve walked and how many calories you’ve burned. The stroller also carries infants(! ), facing in either direction, and it has dedicated storage areas for keys, phones, wallets, and diaper bags. A retractable canopy keeps the sun off the kid, while a height-adjustable handle can accommodate parents of different statures. It might actually be better equipped than the minivan you also had to buy before your new arrival arrived.